Our Lodge provides a place for families to gather and is stocked with books, board games, magazines and a kid’s corner for rainy days or stop by in the evening for a game of air hockey. The Lodge has been newly renovated and is a place to meet and greet or just relax. Off season it will be available to groups for parties, weddings, and other special events. 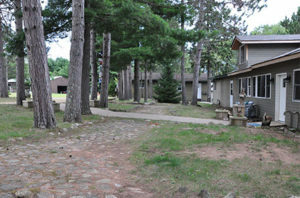 The Lodge in a peaceful setting on the beautiful Lost Land Lake area of Hayward, Wisconsin. Let us share with you our rustic, cozy warmth!